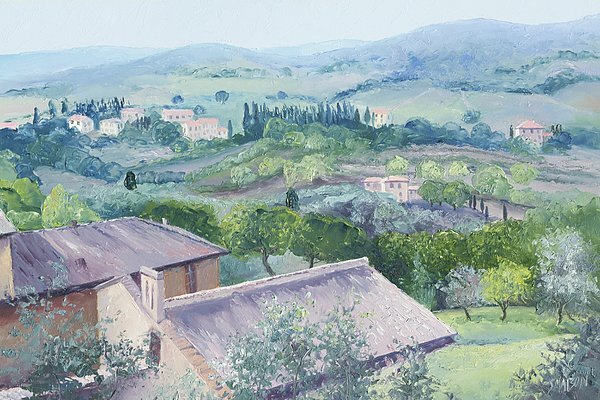 Love the soft pastels you chose for this landscape! A beautiful oil painting...love the wonderful soft palette! Beautiful work! Wonderful colors and style! Stunning work of art. Love the soft color choice here! 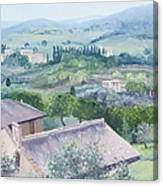 An oil painting of a view from the beautiful hilltop village of San Gimignano in Tuscany. 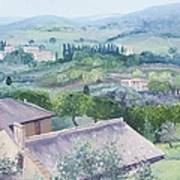 Every view gives you blue rolling hills, villas, cypress pines and olive groves. Tuscany prints are available as stretched canvas prints, acrylic, metal, framed, posters, phone cases, greeting cards, duvet covers, tote bags, beach bags, shower curtains and throw pillows. 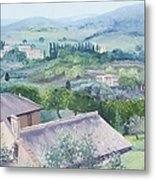 This Tuscan landscape painting is featured in the group "Premium FAA Artists" on Fine Art America.